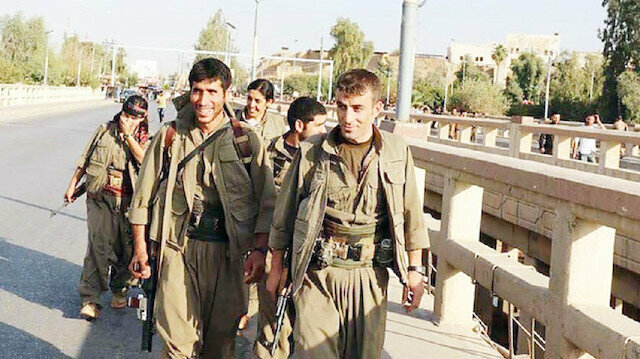 The Kurdistan Workers’ Party (PKK) is rapidly increasing its presence in Iraq’s ancient city of Kirkuk with the support of Israel. It was revealed that the terror organization has dozens of “liaison offices” in the region of Kirkuk, with six of them located in the city center. These PKK “offices” are being funded by Israeli companies that carry out their activities under the name of “al-Aman,” say local sources. The terror group in its turn ensures the “security” of these companies and provides them with a constant flow of intelligence. As the PKK searches for alternative locations to amass other than the Qandil Mountains in northern Iraq, it established so-called military bases in the south of Kirkuk, after Sinjar and Makhmur. At the terror camps around Kirkuk, Israeli officers train PKK terrorists on bombs, weapons and sabotage. Israel provides technical support for the terror group, which has formed its new attack strategy on unmanned aerial vehicles. The PKK is listed as a terrorist organization by Turkey, the European Union and the United States. The PKK has been conducting armed violence in the southeastern part of Turkey since 1984. More than 40,000 people, mostly civilians, have been killed in the three-decade long conflict. Turkish ambassador to Paris on Wednesday said Ankara has repeatedly warned its allies that the YPG/PYD terrorist group is as deadly as Daesh.Speaking at a conference entitled “Turkey: European and Regional Perspectives” at the Institut Diderot in Paris, Ismail Hakki Musa highlighted Turkey’s role in hosting 3.5 million Syrian refugees as well as humanitarian relief efforts worldwide, spending as much as $8 billion as the world’s second most charitable country.He also spoke about Turkey-EU cooperation on security and counterterrorism and said his country is an “important actor” in this regard.Musa stressed that Turkey has been one of the most effective members of the international coalition against the Daesh terror group and that “neutralized” over 3,000 terrorists in Syria thus far.Noting that Europe had only heeded Ankara’s warnings against Daesh after the terror group began conducting attacks on the continent, the ambassador said that Turkey’s goal with the U.S. on Manbij was to clear the area of the PYD/YPG and deliver the region to its real owners.On Nov. 1, Turkish and U.S. troops began joint patrols in Manbij, northeast of the Aleppo Governorate in Syria, as part of an agreement that focuses on the withdrawal of YPG/PKK terrorists from the city to stabilize the region.The YPG is the Syrian offshoot of the PKK, a terrorist group recognized by Turkey, the U.S., and EU, which in its 30-year terror campaign has taken some 40,000 lives.The U.S. has claimed the YPG/PKK is an “ally” in the fight against Daesh, over Turkey’s objections that one cannot use a terrorist group to fight another.Turkey has repeatedly cited evidence that the YPG is no different from the PKK. The U.S. is pursuing a “hypocritical” policy regarding the PKK terrorist group by supporting PKK terrorists in Iraq’s Sinjar district through northern Syria, Haider Saso, secretary-general of Iraq's Ezidi Democratic Party, said Wednesday.Speaking to Anadolu Agency, Saso, who resides in Sinjar, blasted what he described as ongoing cooperation between the U.S. and the PKK. "The U.S. is pursuing a two-faced policy when it comes to the PKK,” he said. “While it puts prices on the heads of top PKK operators, it collaborates with the group in Sinjar and in northern Syria.”Erdoğan blasts countries that support PKK but not its victimsSinjar, he went on to assert, was “teeming with” PKK military bases and camps. "The U.S. and the PKK, along with the latter’s many affiliates, are working in tandem,” Saso said, accusing the PKK of forcibly recruiting Ezidi youth.“The U.S. is helping the PKK and its affiliates in Sinjar through the PYD/YPG terrorist group in northern Syria,” he added.Hundreds defect from PKK terror group as Turkish ops gain paceOfficials from Iraq's central government have recently met with their Turkish counterparts to discuss means of driving the terrorist group from Iraqi territory.Saso, for his part, says the PKK is receiving financial assistance through the Iraqi army and the Hashd al-Shaabi, a predominantly Shia fighting force.In mid-2014, the PKK sent fighters to Sinjar -- from Syria and Iraq’ northeastern Qandil region -- on the pretext that it was protecting Ezidis from the Daesh terrorist group.US sends medical aid to PKK terrorists in Iraq’s QandilBut even though the region was later cleared of Daesh terrorists, the PKK has continued its expansionist policies in the area, Saso said.In October of last year, the Iraqi government sent federal troops into parts of northern Iraq “disputed” between it and the Kurdish Regional Government -- including Sinjar.After federal forces moved into Sinjar, the PKK falsely claimed to have withdrawn from the region.